“Partho Nag, a childhood friend of Shubhrangshu Roy’s who lives in the same New Delhi suburb. Mr. Nag, who runs an IT service company out of his home, joined Mr. Roy and other friends as they volunteered at the Hazare protests. “We’ve been told since our childhoods, ‘Politics is bad, don’t get into politics,'” Mr. Nag said. “But the point is that somebody has to clean it up. We can’t just scold people.”” Source of caption and photo: online version of the NYT article quoted and cited below. 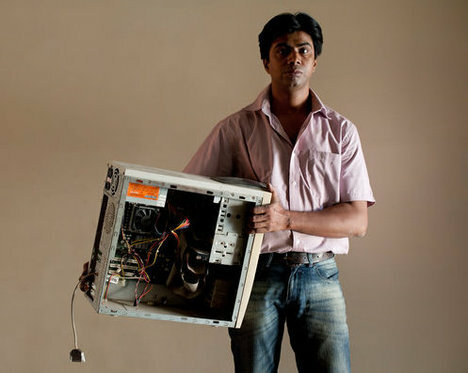 (p. 1) DWARKA, India — Shubhrangshu Barman Roy and his childhood friends are among the winners in India’s economic rise. They have earned graduate degrees, started small companies and settled into India’s expanding middle class. They sometimes take vacations together and meet for dinners or parties, maybe to celebrate a new baby or a new business deal. (p. 10) “This middle class is less about ‘what the state can do for me’ than ‘the state is preventing me from doing what I want to do,’ ” said Devesh Kapur, director of the Center for the Advanced Study of India at the University of Pennsylvania. On a recent afternoon, Mr. Roy pointed to a crude asphalt scar in the road where workers had installed an underground water connection. The scar extended along the road toward Mr. Roy’s house, only to abruptly turn left in the direction of another building. JIM YARDLEY. “INDIA’S WAY; Protests Help Awaken a Goliath in India.” The New York Times, First Section (Sun., October 30, 2011): 1 & 10.